Feature | When you think about super speedways and oval track racing you think about NASCAR, Indy roadsters and American-style racing. But during the golden age of motor racing from the turn of the century until the Second World War, a number of large banked tracks were built in Europe. Some of these tracks were much larger than anything ever built in America. Brooklands in England was the first built. It has been badly damaged for years but is supposedly being restored by Daimler-Chrysler. Avus was twelve miles long and ran through Berlin. It featured two long straights connected by huge banked turns paved with brick. Montlhery in France was active until last year but is likely to be destroyed to make room for “development.” Miramas In southern France is owned by BMW but is in bad shape. The great Monza in Italy is now unusable and likely to be torn down. There is however one of the great tracks of the twenties left intact. It lies slumbering like a long lost Roman ruin in northwest Spain. Outside of the little town of Sitges is the Autodromo Nacional. It is the only one of the banked tracks of Europe left in its original state. The Autodromo was built during an optimistic period in Spanish history. During the early twenties Spain was trying to catch up with Germany and Britain. Modernismo was all the rage. Among other things the government was looking to build a large road system. The Portland Cement company was to supply the concrete for the roads and they established a plant near Sitges. The Autodromo was a sample to show the quality of their product. The track is two kilometers long and roughly kidney shaped. There are garages in the center as well as grand stands around parts of the exterior. Two Spanish architects designed it in 1922. Jaime Mestres I Fossa laid out the track and Josep Martino Arroyo designed the grandstands and garages. It was built by the German firm of Tanner and Eigenheer and was open for racing in 1923. Even though the track looks a little rough it is structurally in very good shape and is a testament to the quality of Portland cement. The Autodromo benefits from being the last of these tracks built before the war The grand opening of the track was a big deal and a huge program of racing at two tracks was planned over the course of two weeks. The racing program included motorcycles, cycle cars, vioturettes, and Grand Prix cars. Special transportation had been arranged to bring spectators to the track and on opening day over thirty thousand people were in attendance including King Alfonso XIII. The first Spanish Grand Prix was run over two hundred laps and despite five no shows seven starters were flagged off. The top drivers of the race were Dario Resta and Albert Divo driving Sunbeams and Count Luis Zbrowski driving a Miller 122. Resta retired after one hundred laps and Divo ended up winning the race. Zbrowski set fastest lap at 97.49 mph. This was to be the fastest lap ever at the Autodromo Nacional. Later in the day the motorcycle Grand Prix was held on the same track and featured a young Tazio Nuvolari racing a 500cc Borgo. As a spectator event the racing program was a huge success. However financially there were problems. Construction had gone over budget and the construction firm had not been paid. As a consequence they seized the gate receipts for the opening weekend. None of the prize money was paid to the racers and the badmouthing began. Despite the success of the first weekend and the speed of the race drivers complained that the track was unsafe. The banking had been designed for 200kph with a 100-meter radius and 60 degree banking. Drivers complained that the banking sucked them in too hard and spit them out. It didn’t take long for the place to be shunned by the racing community. The promoters tried every thing they could think of to attract business but it all came to nothing. 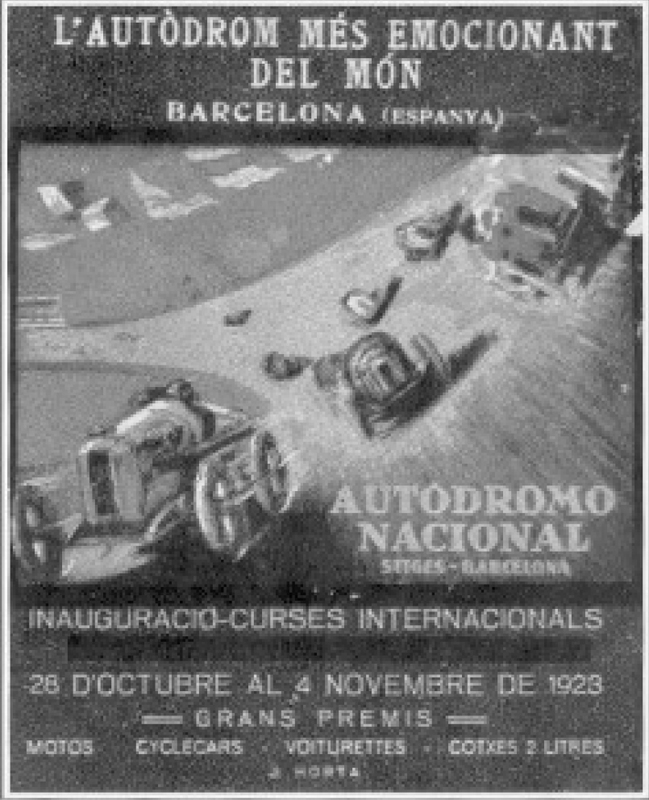 By 1925 the track was dormant and not long after that the Spanish Civil War and the resulting social upheaval crushed all hopes of racing for years to come. 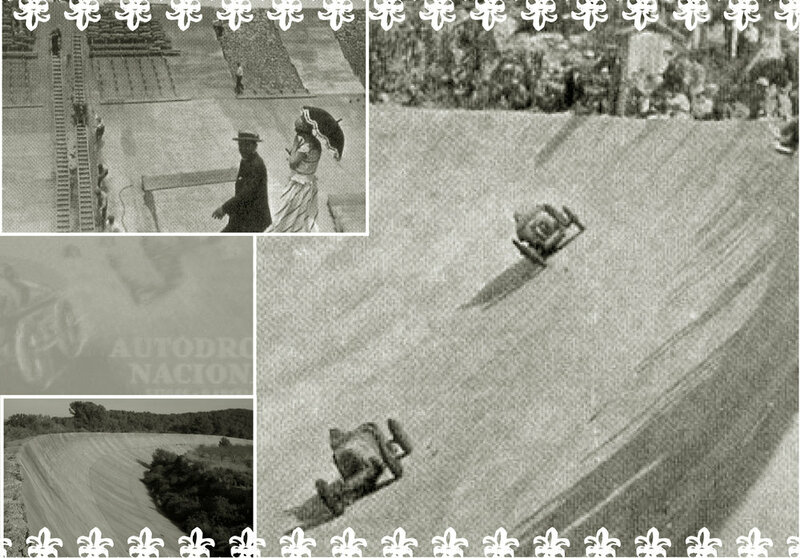 The Autodromo Nacional began an eighty-year slumber.